OUTCAST: "THE ONE I'D BEEN WAITING FOR"
Cinemax has released images and details from "The One I'd Been Waiting For," the episode of Outcast premiering on Friday, August 19 at 10 p.m. (ET/PT).
" Kyle (Patrick Fugit) and Anderson (Philip Glenister) learn more about the role Kyle�fs father played in Rome�fs history of possession. Anderson is taunted by an old foe, who recently resurfaced and is wreaking havoc in town. With nowhere to go, Megan (Wrenn Schmidt) takes Holly (Callie McClincy) to a familiar but forbidding place. Sidney (Brent Spiner) instructs an ally to keep Giles (Reg E. Cathey) in line. The episode was written by Rebecca Sonnenshine and was directed by Alrick Riley. IDW Publishing has announced a November launch for Magic: The Gathering: Chandra, written by Vita Ayala and drawn by Harvey Tolibao. 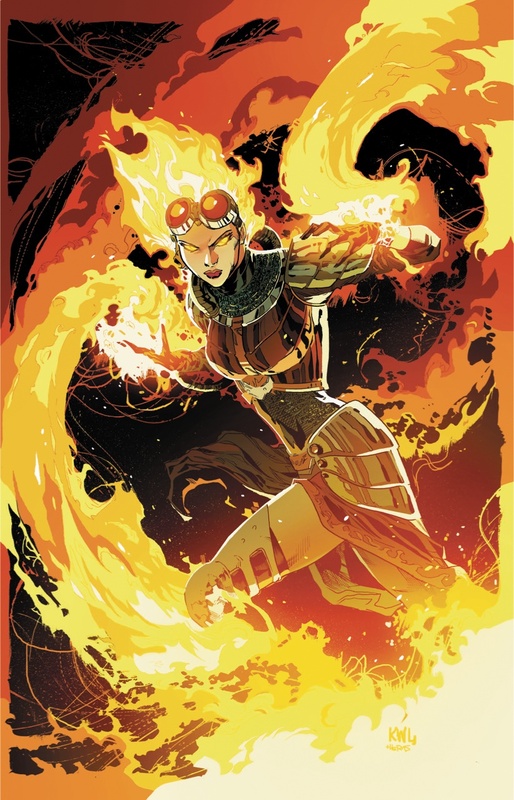 The book, featuring all-new adventures of the pyromancer Planeswalker Chandra Nalaar, is the first Magic: The Gathering comic in four years and will introduce an all-new approach to storytelling as the franchise marks its 25th year. "With meteorically rising star Vita Ayala penning these tales, with the incredible art of Harvey Tolibao delineating the adventures, and with the introduction of the dynamic and powerful Chandra Nalaar, it's clear we've entered a bold new era of storytelling," said John Barber, IDW's editor-in-chief. "Everybody involved in this comic is dedicated to bringing you emotional and thrilling experiences that will satisfy fans of Magic: The Gathering -- as well as fans of stories packed with action and drama told from a unique point of view." "An adventurous Planeswalker and powerful pyromancer, Chandra Nalaar has seen much in her time -- but she had never experienced such tragedy before. In the wake of a devastating loss, Chandra is striking out on her own, determined to prove -- to her family and to herself -- that next time she'll be prepared. But when faced with threats both old and new, will she be able to overcome her grief in time to survive? And who is that familiar face lurking in the shadows?" For covers and five- to six-page previews of Titan Comics titles arriving in stores on Wednesday, August 15, click on the cover thumbnails above or the links below for the individual titles. * THE GIRL WHO DANCED WITH DEATH -- MILLENNIUM #1. * RIVERS OF LONDON: WATER WEED #3. ZENESCOPE FIRST LOOKS: For cover and six-page preview of Revenge of Wonderland #2, arriving in stores on Wednesday, August 15 from Zenescope Entertainment, CLICK HERE. ASPEN FIRST LOOKS: For cover and six-page preview of Artifact One #0, arriving in stores on Wednesday, August 22 from Aspen Comics, CLICK HERE. Below are solicitations posted for October. Click on the publisher's name for the full listings and look for more listings soon here in The Continuum.